Trees add to the beauty and greenery of your property, provide shade and help cool the temperature. Aside from this, they breathe out oxygen into the air which makes the air in your immediate vicinity fresher as well. It’s rare to find a property owner that would want to cut down the trees on their property, but trees can sometimes become problematic and pruning becomes necessary to keep their growth in check. This is when you start looking for tree pruning Rushcutters Bay companies in your local area. When you are looking for a tree pruning Rushcutters Bay service, you need to be assured that the company you hire would be able to handle the job safely and efficiently. We at North Beaches Tree and Garden Services have been operating in this space for over 15 years and cater to both residential and commercial customers. We are highly committed to our work and focus on providing our clients value for money with our custom, tree pruning and removal service in Rushcutters Bay. Crown thinning services- The secondary branches of the tree are removed and the foliage is thinned down by about 10%. This allows more light and air to the spaces around the tree and offers a better view as well. Selective Pruning- There are times when certain branches grow in a way that they cause a problem; they may be growing just above your driveway and provide the perfect place for birds to perch above your parked car. At times, overgrown branches tap against windows which can become an annoyance and provide entry to pests, through the windows as well. Selective pruning is the ideal option to safely remove these problematic branches without damaging the tree’s structure. Dead wooding- This involves the removal of all the dead branches and prevents these branches from falling down in windy weather. We use this technique to remove the smaller branches that regularly fall from trees. This reduces the chances of damage to your property as well the frequency of the twigs and branches littering the outdoor spaces of your property. 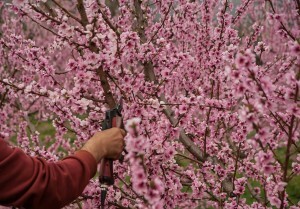 Crown Lifting- In this technique, the lowest branches of the trees are pruned. This helps improve clearance for spaces where you need better access from the lower branches that may be obstructing your driveway, pathway or any other area of your yard or landscape. Aside from this, we also use the latest tools and techniques to handle palm pruning, line clearance, formative pruning and remedial pruning. Regular pruning helps maintain the health of your trees and improves the appearance and value of your property as well. We have created a distinct niche for ourselves and provide excellent, safe and affordable tree pruning Rushcutters Bay service. For any more information feel free to call North Beaches Tree and Garden Services on 0425 804 830. You can also request a FREE no-obligation quote via this form or even send us any queries you may have.